I told a friend of mine I was going to write a profile on Fisher Ames. I carefully considered my friend’s point. Government isn’t the answer…it’s the problem. It then occurred to me: Like most modern conservatives, my friend had missed the point. To say that government isn’t the answer to our nation’s problems is to presuppose the wrong incentive for erecting government in the first place. Fisher Ames would know that. And that’s why he’s relevant. Yet much can be learned from the life of Ames, and not just from his rhetoric (which gave us the wittiest of all retorts when, in response to the declaration that all men are created equal, he quipped: “But differ greatly in the sequel”) or from his writing (“Constitutions are but paper; society is the substratum of government”). He was, in Russell Kirk’s words, a man many years dying. This was because in his youth, well before his tubercular demise, he displayed more promise than perhaps any of our other great statesmen. Fisher Ames personified two of conservatism’s most indelible tenets: life is fragile and all is vanity. At the time, Ames was enamored with notions of liberty and independence. As a member of Harvard’s Speaking Club, he gave such patriotic orations as a recital of Benjamin Church’s speech on the Boston Massacre (“When will the locust leave the land?”) and a rendition of Cicero’s defense of Titus Annius Milo (“by my single efforts has it been brought to pass that right, and equity, and laws, and liberty, and modesty, and chastity remain in this city”). But he was also unknowingly receiving his first lesson in conservative thought. Soon he would see how the people embraced their “liberty.” He would not like what he saw. His eyes opened in 1786, when boom and bust hastily descended on the new republic. The bust proved difficult to weather, especially for rural inhabitants of New England. 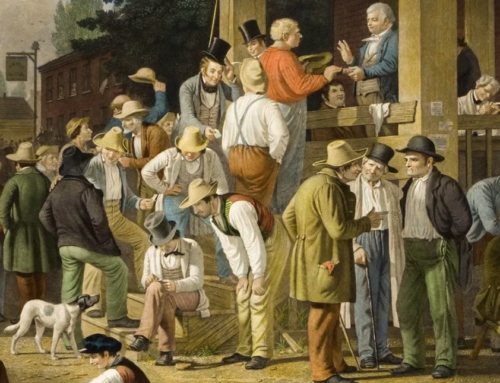 A precipitous fall in agricultural prices, a shortage of paper money, high taxes, and a rise in foreclosures led many rural New Englanders—believers in an inalienable right to protest the state—to take up arms against their newly formed governments. 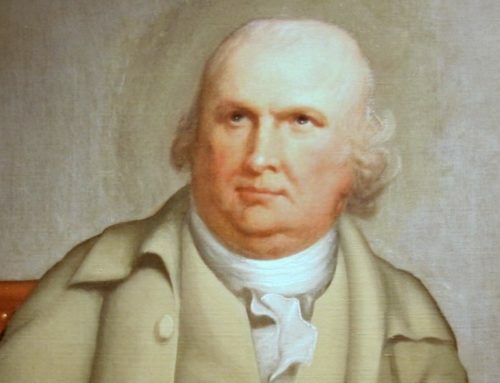 Led by Daniel Shays, an ex-captain in the Continental Army, the rebellion shut down numerous county courts and brought the impotence of the Articles of Confederation to light. Ames’s faith in “sage politicians” reflects the fading optimism that he still held for the American enterprise. About this time he wrote, with decidedly less predestination than in subsequent musings, “If we fall we fall by our folly not our fate.” And in defending the idea of biennial elections, he gave credence to the “sober second thought of the people.” Such credence he would never entertain later in life. Whatever optimism Ames may have felt in the aftermath of Shays’s misadventure, the French Revolution would exorcise it. The Terror was one of two influences that finally molded Fisher’s conservative philosophy. The other was witnessing firsthand his fellow congressmen in action. He had first come to the nation’s capital—then situated in New York—with a great deal of enthusiasm and all the fire that political upstarts display. But by the time he left office in 1797, he had realized that the great orators and statesmen of our land were anything but “demigods” or “Roman senators.” According to biographer Winfred E.A. Bernhard, even some of the men Ames held in esteem—James Madison for one—he found too “pedantic” and “impractical” for governing. What is patriotism? Is it a narrow affection for the spot where a man was born? Are the very clods where we tread entitled to this ardent preference because they are greener? No, sir; that is not the character of the virtue, and it soars higher for its object. It is an extended self-love, mingling with all the enjoyments of life, and twisting itself with the minutest filaments of the heart. It is thus we obey the laws of society, because they are the laws of virtue. In their authority we see, not the array of force and terror, but the venerable image of our country’s honor. Every good citizen makes that honor his own, and cherishes it not only as precious, but as sacred. He is willing to risk his life in its defense, and is conscious that he gains protection while he gives it. For what rights of a citizen will be deemed inviolable when a state renounces the principles that constitute their security? Or if his life should not be invaded, what would its enjoyments be in a country odious in the eyes of strangers and dishonored in his own? Could he look with affection and veneration to such a country as his parent? The sense of having one would die within him; he would blush for his patriotism, if he retained any, and justly, for it would be a vice. He would be a banished man in his native land. Funding of the treaty helped stay a war with Britain and ushered in a decade of prosperous trade with the country from which we won independence. Successes notwithstanding, Ames was forced to forego reelection in 1796 due to declining health. To his chagrin, nothing he achieved while in office seemed to carry any lasting influence. The United States were shifting culturally and electorally. The Federalists were declining as a party. The Republicans—the “Jeffs” as he called them—were growing. Soon, war with Britain would come; France under Napoleon would loom as a threat; rights-speak would become the vernacular of the governed as well as the governors; and Jefferson’s shadow would forever cast itself upon the nation. But Jefferson’s planter society happened to have hung its hat on an immoderate—and infamously peculiar—institution. And whatever Federalist ideals were in place before Reconstruction, we lost them in its wake. is democracy. It is not the skin that festers—our very bones are carious and their marrow blackens with gangrene. Which rogues shall be first, is of no moment—our republicanism must die, and I am sorry for it….Nevertheless, though I indulge no hopes, I derive much entertainment from the squabbles in Madam Liberty’s family. After so many liberties have been taken with her, I presume she is no longer a miss and a virgin, though she may still be a goddess. A sheer pessimist would not have conveyed such warmth in his waning hours, nor would he have found Madam Liberty still a goddess. Fisher Ames died on the Fourth of July, 1808. Everyone knows the story of how Thomas Jefferson and John Adams both died on the Fourth of July, 1826, a half-century after the signing of the Declaration of Independence. Every Independence Day, great respect is given to the memory of Jefferson—and at least a little to Adams. But no mention is ever made of that other Founding Father who died on the Fourth of July, primarily because he wasn’t a president. The arch-elitist Ames is forgotten beside two men whose 44-man fraternity resembles the closest thing we have to a monarchy. You can’t make a democratic society remember something it doesn’t want to remember, which brings us back to where we came in. Anti-statist conservatives forget that we left the state of nature in the first place because the souls of men, which are inherently depraved, need nurturing, and only institutions can provide that. But democracy will not tolerate institutions of restraint, political or otherwise. Fisher Ames warned us well, if only we could recall his words. About the Author: Stephen B. Tippins Jr.
Stephen B. Tippins Jr. is an attorney practicing in Buford, Georgia. Two questions please. Will the book be out in time for Christmas shopping? And why isn’t there a dining club commemorating this man?